Because of the delicate surface and excellent quality, coated aluminum coil becomes the first choice of the users, as to different using demand, users should pay attention to some impacts in the application particularly. So, what should pay attention to when using coated aluminum coil? Here, let us look over together. 1. If the coated aluminum coil is going to put into use, the normal temperature is needed, the temperature shouldn’t be too high nor too low, if it is used as a roof, the temperature should be no less than 10 degrees. 2. Before installation, the coated aluminum coil should be checked timely, ensure there are not worn on the surface to ensure the normal use, under normal circumstances to ensure the using life. 3. The bolt head which fixed the color coated aluminum coil should be sealed with strong waterproof material to avoid rain enters and causes rust. 4. Aluminum coil processing temperature should be higher than 7 ℃, the clearance between the roll system shall be adjusted according to the thickness of the aluminum coil, and clear the foreign materials on the roller surface and plate. 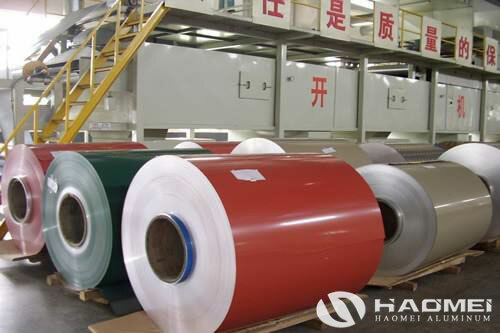 At the same time the users should check if the lacquer of double-sided aluminum coil is to take off, if it happens, we should find out the reason and adopt measures to continue processing. If want to ensure the construction quality of coated aluminum coil, the above use precautions will be in accordance with.